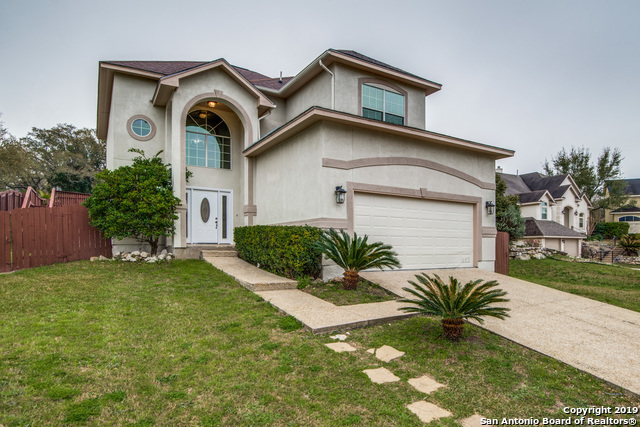 All CANYON CREEK BLUFF homes currently listed for sale in San Antonio as of 04/22/2019 are shown below. You can change the search criteria at any time by pressing the 'Change Search' button below. "This beautiful custom home has been remodeled with a new Kitchen, flooring (tile and carpet), and bathrooms! Master bedroom has a nice sitting area and plenty of closet space!! Stainless steel appliances will be installed once offer is accepted. Conveniently located less than a mile from 1604 / Blanco Rd. Nearby shopping areas and restaurants for convenience. House sits in a cul-de-sac street towards the end of the street." "Gorgeous custom home gated community in an extremely prime location on a cul-de-sac. The home is updated with new paint and shows like a new model home. It features a gourmet kitchen with granite counter tops stainless steel appliances and double ovens. The windows all have beautiful plantation shutters, and downstairs you have beautiful hardwood floors. Luxury master to include bay windows master bath has copper sinks a whirlpool tub and large walk in shower. Side entry garage leads to a great "
"This gorgeous two story home is located in the highly desirable gated neighborhood of Canyon Creek Bluffs. This well-maintained, one owner home is just one minute south of 1604 and minutes from 281--great location and school districts! This home accentuated with red brick and white stucco includes an open floorpan, high ceilings in the master and living room, a lot of storage and mature oak trees with great curb appeal. The house was freshly painted and the roof were replaced in 2016--Dont miss "